or the Start of an Insane Bubble? Just for fun, the next time you talk to your neighbours, ask them if they know what a bitcoin is. Chances are that they will give you a blank look, scratch their heads or look at you as if you just emerged from a space craft. Hopefully, this book will help to rectify that. Bitcoin Mania will explain what bitcoins are; how they originated; how you can get your hands on them and how you can spend them. They are rapidly developing into a world currency which is digital, highly encrypted, easily and inexpensively transferred across international boundaries without revealing the identities of the sender or receiver. Bitcoins can be used to purchase goods and services, gift cards or for online gambling. Unfortunately, they have also been used for illegal purposes such as the purchase of narcotics, guns, counterfeit money and identity cards and for money laundering, as revealed in the fascinating FBI inditement of a character who goes under the alias Dread Pirate Roberts. The ease with which bitcoins can be inexpensively transferred on a peer-to-peer basis threatens to undermine the revenue stream of the current archaic commercial banking and credit card systems which rely on built-in inefficiencies to generate vast amounts of profit at the consumer’s expense. It is no wonder that they are hostile to the introduction of a system that would undermine the revenue streams which they have enjoyed for so many years. Indeed, deregulation of the banking industry allowed commercial banks to make risky loans and investments; to get involved with sub-prime mortgages to such a degree that when the real estate market crashed in 2008, most of them were caught with their pants down and the whole system almost collapsed. Since then, consumers in the United States and the peripheral nations of Europe have had to pay dearly for the errors of judgement made by bank executives. Fortunately, regulators have stepped in and placed the banks on a somewhat tighter leash, however, many very serious risks remain and this book looks at how bitcoins could provide a logical antidote. The anonymous and highly encrypted nature of bitcoins makes their movement hard to track and this flies in the face of government agencies who have empowered themselves to snoop on phone conversations and e-mail messages under the guise of protecting national security. Bitcoin transactions also frustrate tax authorities by making it more difficult to detect taxable income, capital gains and money laundering. Trying to tame the Bitcoin beast is no easy task because of its distributed nature and lack of central authority. This book will examine the uneasy coexistence of bitcoins, gold and paper currencies and some of the issues surrounding the current system of world banking. It also examines other cryptocurrencies and poses the question of whether off-planet banking will evolve on its own over the next 100 years or whether it will be forced upon us as the paper currencies of the world are crushed under mountains of self-imposed national debt. This book is a provocative, caustic, thought-provoking and entertaining read. Enjoy! Chapter 1: Welcome to Bitcoinland! Chapter 4: Let's Go Gambling in Cyberspace! Chapter 6: Could You Hold Bitcoins as an Investment? Chapter 9: In Bitcoins we Trust...or Do We? Chapter 10: Don't Be Fooled....The Tax Hounds Are Watching For Evidence of Your Bitcoin Transactions! Chapter 14: Will the Good Guys With Guns Quell the Rebellion Against Fiat Currencies? 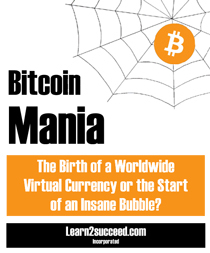 Chapter 15: Greenspan's Latest Epiphany: A Bitcoin "Bubble"
Bitcoin Mania: The Birth of a Worldwide Virtual Currency or the Start of an Insane Bubble? by: Learn2succeed.com Incorporated: Softcover; 156 pages; ISBN: 978-1-55270-500-1 published in March 2014; $24.95.